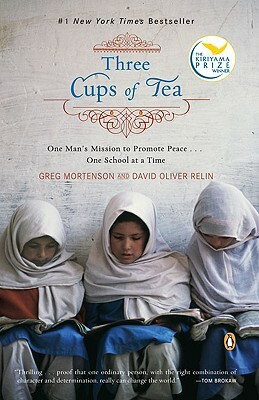 There is a telling passage about Mortenson's change of direction at the start of the book: "One evening, he went to bed by a yak dung fire a mountaineer who'd lost his way, and one morning, by the time he'd shared a pot of butter tea with his hosts and laced up his boots, he'd become a humanitarian who'd found a meaningful path to follow for the rest of his life." What made Mortenson particularly ripe for such a transformation? Has anything similar happened in your own life? Relin gives a "warts and all" portrait of Mortenson, showing him as a hero but also as a flawed human being with some exasperating traits. Talk about how Relin chose to write about Mortenson's character—his choice of details, his perspective, the way he constructs scenes. Is Mortenson someone you'd like to get to know, work with, or have as a neighbor or friend? At the heart of the book is a powerful but simple political message: we each as individuals have the power to change the world, one cup of tea at a time. Yet the book powerfully dramatizes the obstacles in the way of this philosophy: bloody wars waged by huge armies, prejudice, religious extremism, cultural barriers. What do you think of the "one cup of tea at a time" philosophy? Do you think Mortenson's vision can work for lasting and meaningful change? The Balti people are fierce yet extremely hospitable, kind yet rigid, determined to better themselves yet stuck in the past. Discuss your reactions to them and the other groups that Mortenson tries to help. After Haji Ali's family saves Greg's life, he reflects that he could never "imagine discharging the debt he felt to his hosts in Korphe." Discuss this sense of indebtedness as key to Mortenson's character. Why was Mortenson compelled to return to the region again and again? In your opinion, does he repay his debt by the end of the book? References to paradise run throughout the book—Mortenson's childhood home in Tanzania, the mountain scenery, even Berkeley, California, are all referred to as "paradise." Discuss the concept of paradise, lost and regained, and how it influences Mortenson's mission. Mortenson's transition from climbing bum to humanitarian hero seems very abrupt. However, looking back, it's clear that his sense of mission is rooted in his childhood, the values of his parents, and his relationship with his sister Christa. Discuss the various facets of Mortenson's character—the freewheeling mountain climber, the ER nurse, the devoted son and brother, and the leader of a humanitarian cause. Do you view him as continuing the work his father began? "I expected something like this from an ignorant village mullah, but to get those kinds of letters from my fellow Americans made me wonder whether I should just give up," Mortenson remarked after he started getting hate mail in the wake of September 11. What was your reaction to the letters Mortenson received? Mortenson hits many bumps in the road—he's broke, his girlfriend dumps him, he is forced to build a bridge before he can build the school, his health suffers, and he drives his family crazy. Discuss his repeated brushes with failure and how they influenced your opinion of Mortenson and his efforts. The authors write that "the Balti held the key to a kind of uncomplicated happiness that was disappearing in the developing world." This peaceful simplicity of life seems to be part of what attracts Mortenson to the villagers. Discuss the pros and cons of bringing "civilization" to the mountain community. Much of the book is a meditation on what it means to be a foreigner assimilating with another culture. Discuss your own experiences with foreign cultures—things that you have learned, mistakes you have made, misunderstandings you have endured. Did the book change your views toward Islam or Muslims? Consider the cleric Syed Abbas, and also the cleric who called a fatwa on Mortenson. Syed Abbas implores Americans to "look into our hearts and see that the great majority of us are not terrorists, but good and simple people." Discuss this statement. Has the book inspired you to learn more about the region?